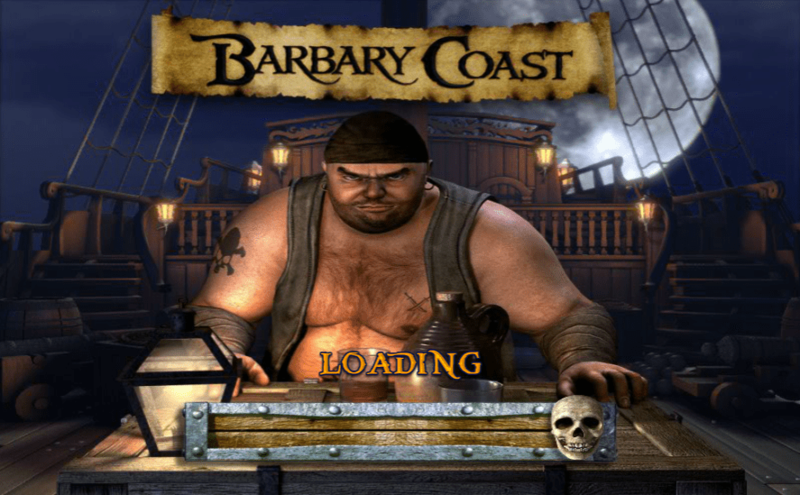 Disney’s Pirates of the Caribbean franchise and movie series don’t have anything on the likes of the Barbary Coast slots game by BetSoft. Like the Disney productions, you will face challenges, scares, good fortunes, evil fortunes, being chased by snarly pirates and chances to narrowly “escape with your life” – all in 3D and living color. Hunting for buried treasure at the spot marked “X” is at once exciting and habit-forming, some say addictive. The secrets lie in the 5 reels and 30 paylines where the high-definition graphics woo you with fierce sword battles, epic beer guzzling matches and Bonus Rounds of the haunting variety. Barbary Coast slots is currently available online and in land-based gaming salons. The online versions run on Windows and Mac and require no download of software to clog your gaming drives on your computer. Sadly, the game has not been made ready for mobile devices, but those iterations will probably come before we reach landfall. As intuition would suggest, the Barbary Coast is part of the Adventures genre of slots games, and this one is centered around pirates, buccaneers, black flags, skull and crossbones and the open and treacherous seas. Unfortunately, some gamers will recognize the oxymoron of placing Blackbeard and the Barbary coast in the same game, because Blackbeard was an English privateer who haunted the Bahamas and the other Caribbean Islands, whereas the Barbary Coasts are off the coast of North Africa. Perhaps Blackbeard sailed the Mediterranean Sea on weekends or during his summer breaks. Entirely possible in fantasyland, I suppose. But I digress. Captain Blackbeard, as his name foreshadows, is a mean and ornery sort, fierce and cantankerous, and in constant search for more and more booty to be stolen from raided cargo ships. In Barbary Coast, Blackbeard and his band of brothers kidnap a beautiful damsel who is now very much in distress. The chance of a lifetime to become a Blackbeard protégé arrives when you are invited aboard the Captain’s ship to join his infamous crew. You, of course, accept; but being the honorable gentleman or gentlelady that you are, your true intentions are to rescue, Walt Disney style, the damsel and relieve her of her stress. By effectuating a successful rescue, you score some awesome treasure of your own and get many Bonus Rounds to boot – all without leaving the comfort of your armchair. The iconic symbols of Barbary Coast are Captain Blackbeard, a Parrot, a Treasure Map, a Cannon, Ben Sawyer, a flintlock Pistol, the stressed Damsel, Grog, beer, and more grog. The value of the coins in Barbary Coast narrowly ranges from two cents to fifty cents, with a maximum of 5 coins per line. The maximum overall bet is 150 coins. You will be prompted to place a bet of your chosen value on each payline you wish to activate. There are a total of 30 paylines. You now have the option to press the Max Bet or Spin button. The jackpot can only be hit if you make the maximum bet on all lines and then the jackpot will pay out 12,500 coins. The five controls are easy to master and navigation is intuitive. Barbary Coast is a non-progressive Jackpot game but nevertheless touts the standard Wild and Scatter symbols, as well as the free spins and Bonus Game icons. Beyond the constant fear of being captured by an ill-tempered Pirate, you will be kept alert by the many value-enhancing Bonus Rounds. If you get three Parrots onscreen, you trigger the Parrot Free Spins tool, which will net you five bonus spins. There is an “Explosion” Bonus when the Cannon icon appears, but only when it appears on the center of the 3rd reel. When that happens, the entire reel transforms into a Wild, giving you more chances to increase your earnings. If three Ben Sawyers visit your screen they will trigger the Ben Sawyer Click Me bonus. You will be prompted to click on every Click Me icon to reveal your earnings. This feature is a very frequent occurrence and will definitely enhance your earnings potential. A trio or more of Blackbeard symbols triggers the Blackbeard Fight bonus spins. While in the Bonus Round you will have to do battle with the fearless Blackbeard in an effort to rescue the kidnapped and stressed damsel from her captors. Grog is good. Three grogs are better. Three of them on your screen triggers a Drinking Contest against the great Grog himself. A heads or tails coin toss determines who drinks first, and next, and so on. This also increases your purse size. This is a surprising twist to slots games. Barbary Coast is fun, very exciting an easy to learn to play. It has a couple of unusual twists which also make it intriguing to play. The graphics are great and it is very interactive with a soundtrack that is awesome. The features are commendable as they offer ample opportunity to earn sizable purses, so with the exception of getting history and world geography wrong, I think you should give it the old schoolboy/girl try.